Here’s another important story getting hardly – if any attention – in media. 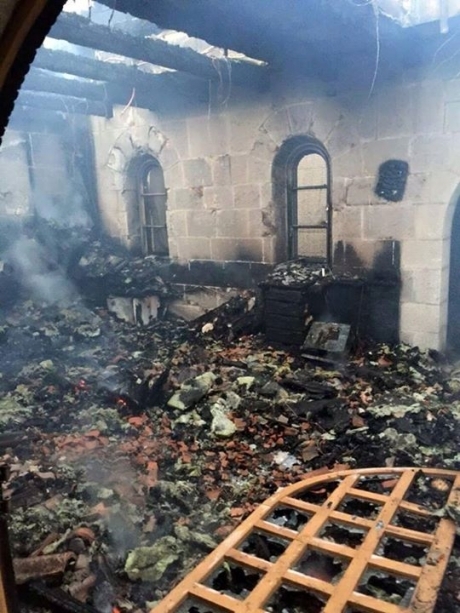 On an erly Thursday morning in June 2015, “Jewish extremists” torched the Church of the Multiplication in Tabgha, near the Sea of Galilee in Israel. The arsonists wrote graffiti in Hebrew on that walls that read, “Pagans” and “False idols will be smashed.” For those who don’t know, the Church of Multiplication is the alleged site where Jesus multiplied loaves and fishes to feed the needy. The Church of the Multiplication is run by the Catholic Benedictine Order and is well-known for its fifth-century mosaics. 1) Why isn’t this story in international headlines? 2) How does Jewish extremism compare to other forms of religious, political, or racial extremism? 3) What can be done about the genocide of Christians in the Middle East? In answer to your first question the MSM only covers radical Islam not radical Jews or radical Christians for that matter. Why? Because the MSM desires to paint a false picture that all Muslims are violent terrorists while Jews and Christians are all about peace loving. Yet, in fact radical Jews and radical Christian groups are just as dangerous. The FBI and DHS know this and that is why they have a heavy focus on domestic terrorists right now. Jewish extremism is hardly ever mentioned in the MSM if at all because the MSM intention is to paint a false picture that all Jews are peace-loving and all are victims is some way or another. Fact is ALL religions have radical and extremist factions within them! In answer to your last question as to what can be done about the genocide of Chrisiians in the Mid East I think the answer is with the Muslim Imams! Instead of preaching political propoganda in their mosques they ought to spend some time preaching about how the Qur’an forbids Muslims from destroying Christian Churches and Jewish Synogogues and they need to preach about the Quranic teaching that Muslims are not to kill Christians or Jews because they are among the “People of the Book” (aka: People of Scripture) all worshiping the same God. History is being destroyed before our eyes not only by ISIS but also radical elements in other faiths there too. And that is the saddest thing of all IMO because that makes us all losers with no winners! What dark, dark times for humanity!! !. I must have missed the bit in the Koran forbidding the destruction of churches and synagogues. I would be grateful if you could supply the sura and verse. Or are you thinking of the apocryphal Covenants of Mohammed to the Christians of the world which Dr Considine regards as factual? 2. The Koran teaches that Muslims are not to kill Christians and Jews as long as “they pay the jizya with willing submission”, otherwise they are fair game. But I’m sure you knew that. 3. Same God or not, everyone must acknowledge Mohammed’s conception of God and worship him in Mohammed’s way or else there will be trouble. I agree all radicals are dangerous but when they are holding the reins of power they are lethal. That has not happened with Christians in America yet or Jews. By far the most dangerous radicals now are ISIS. Because it was Thursday June 18th. It doesn’t compare at all. Since 9/11 there have been about 5 deadly attacks carried out somewhere in the world per day in the name of Islam whereas this (with no fatalities) is the best Dr Considine can come up with from Judaism. Desperate as he is to claim equivalence between Islamic and Christian or Jewish violence, this really takes us into surreal territory. Well, whatever can be done about it, it certainly won’t involve Judaism. Since it is being carried out entirely by Muslims in the name of Islam I suggest we look there first. A good first step would be to enquire whether hostility to Christianity is inherent in Islamic scriptures (it is, along with all other religions which are not Islam). As we are discussing terrorism and genocide I think it is fair to bring up the genocide of the Palestinian people by the Israelis. All genocide is wrong but there is none bigger than the genocide of the Palestinian in that part of the world. As far as I can tell, Israel only kills “Palestinians” in retaliation for the brutal and unjustified “Palestinian” murders of innocent Israelis, often children. So in response, and being the much stronger and smarter party, Israel defends itself. But since a bigot like you would rather have Jews incinerated than have the right to live, you conflate Israel with the Nazis to dehumanize them. That about covers statements like yours. Jack you said: “As far as I can tell, Israel only kills “Palestinians” in retaliation for the brutal and unjustified “Palestinian” murders of innocent Israelis, often children.” I will suggest that you do a little more than that by doing a thorough research of the conflict from the beginning of the Zionist occupation of Palestine. And while doing so use the rule of justice to measure what these Hitlers have done and are doing.. Let me say this to you also: Ask yourself the question; if a foreign people come into your country and force you out of your lands, your homes your business; What would be your reaction? Every people fight back when they are wronged by another people by whatever means they have. The British colonies in N. America rouse up against oppressive British rule and though the the oppressors were superior in Military might, they were able to overcome them and took charge of their own destiny. I am 100% sure the same will happen in Palestine also. It is only a matter of time. You must also learn that the Hebrew Jews who were living a peaceful coexistence with the Muslems in Palestine since Salahuddin took back Palestine from the Crusaders and invited them to come back. He also build homes and Temples for them. These real Jews had made it clear that they prefer to live under Muslem Rule rather than the mostly atheist Ashkenazi converted Jews. These are all written in History. Read about Rabbi Haan the leader of the Palestine Jews. Palestine was a peaceful place before the arrival of the so-called jews. Well of course it’s poorly constructed, because the genocide of Christians is caused by Muslim murderers. There is no dispute about that. But since Muslims are Mr. Considine’s pets and he is a Jew-hater, he has to somehow imply that Jews are the cause of Christians’ deaths rather than the problem that is staring us all in the face – Muslims.